Ottawa-Glandorf’s Kelsey Erford drives to the basket against Bath’s Kaleigh Ketcham during Thursday night’s game at Ottawa-Glandorf. Ottawa-Glandorf’s Kadie Hempfling puts up the shot that secured her membership in the 1,000-point club for her varsity career during Thursday night’s home game against Bath. 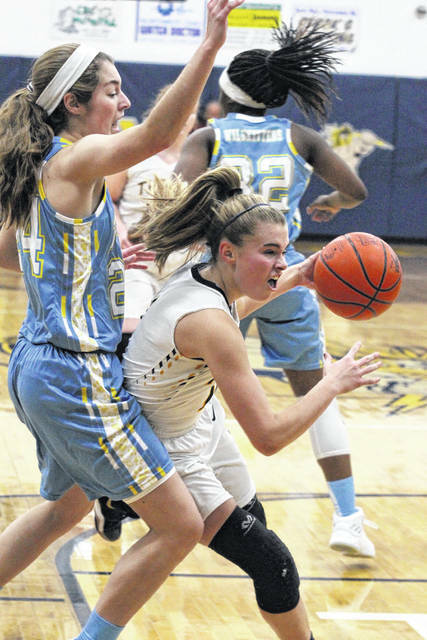 OTTAWA — First, Ottawa-Glandorf’s Kadie Hempfling checked 1,000 points off her list of things to do. Then, she took care of Bath. 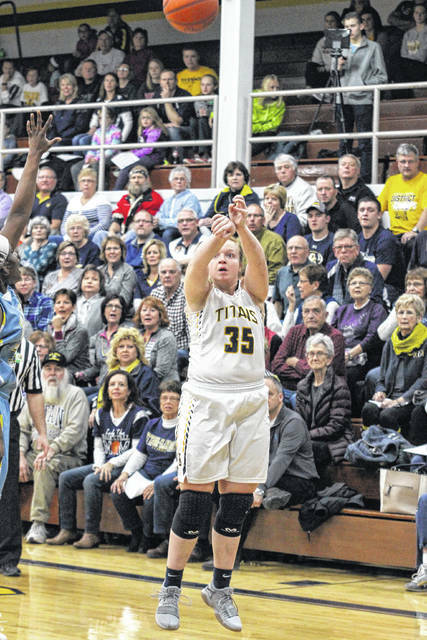 Hempfling scored her 1,000th career point on a night when she had 27 points and 10 rebounds to help the Titans defeat Bath 47-37 in a girls basketball Western Buckeye League showdown Thursday at Hermiller Gymnasium. “It’s the best feeling in the world,” Hempfling said of getting the 1,000th point in a win. Hempfling tied her career high with 27 points, including scoring 12 in the final quarter. O-G led 33-31 after three quarters. The Titans then ripped off a 8-0 to start the fourth quarter to pull out to a 41-31 lead with 3:37 to go. Hempfling scored six during that key burst. Freshman Chandler Clark led Bath with nine points. Lindsay Singhaus had seven points. Elysabette Andrews had six and Jaidyn Hale had five. Erin Kaufman had six points for O-G. Paige Sutter five points and 11 rebounds. Hempfling entered the night with 994 career points. She cleared 1,000 at the 7:10 mark of the second quarter with a 3-pointer from the left wing. That pushed her to 1,002. Bath went right down and scored on a 3-pointer before the game was halted at the 6:55 mark. At that point, Hempfling ran to the corner and hugged her mom and dad, amidst a sea of 1,000-point signs waving in the crowd. Bath is 10-2, 2-1 in the WBL. O-G is 11-1, 3-0 in the WBL. Bath played without starter 5-foot-10 Madelyn Renner, who was out with an ankle injury. Hale was under the weather, but played. “She (Hale) played limited minutes in the second half,” Mauk said. O-G took the lead to stay 31-29 on a Sutter layup with 2:36 to go in the third quarter. The Titans’ man defense was smothering the entire way. The Titans held Bath to 10 second-half points, but only one field goal. Ashley Schroeder watched Hale, while Sutter kept a watch on Singhaus. “The idea was to let someone else beat us (besides Hale and Singhaus),’’ Yant said. Bath played plenty of 2-3 zone early and the Wildkittens led 12-10 after the first quarter. The Wildkittens closed the first half on an 8-3 run to pull out to a 27-22 halftime lead. Bath went mostly man in the second half to help its rebounding. O-G won the boards 39-32 and 16-5 at the offense end. This entry was tagged bath, ottawaglandorf. Bookmark the permalink.